Gretel Anna Wirblich - Edmonton's Burial & Cremation Professionals | Trinity Funeral Home Ltd. It is with great sadness that we say goodbye to our beloved mother, Gretel Anna Wirblich on Dec 24, 2017 at the age of 87. Gretel was predeceased by her husband of 51 years, Erich in 2003. She is mourned by her 6 children: Angelica (Reggie), Don (Urai), Chris (Linda), Ralph (Ratree), Roy (Meike), Mark (Sharon), her brother Martin (Elsa), and sister Martel in Germany, as well as her 9 grandchildren and many friends. Gretel worked hard alongside her husband to establish St. Albert Greenhouses. 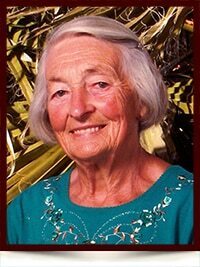 She loved flower arranging and had a florist shop in Edmonton for many years. Most of all, she loved hiking, especially in the Grand Canyon which she did to the age of 86, often leaving younger hikers in her wake. She really enjoyed her winters in Mesa, Arizona where she had many friends. The family would like to thank the staff at the Sturgeon Community Hospital for their care and compassion. In lieu of flowers, donations may be made to a charity of your choice if you wish. A celebration of life will be held in April 2018, with the date to be announced later.